Zac Seewald Photographer. Specializing in the highest quality photos of people and architecture. Zac hails from Austin, TX and works through the US. The Schertz Aquatic Center is a 27,000 sq. ft. facility that is located on a 4-acre site and connects to the Schertz YMCA (who will operate the facility). This facility houses a competition pool, leisure pool, community spaces, locker rooms, spectator seating and amenity areas. 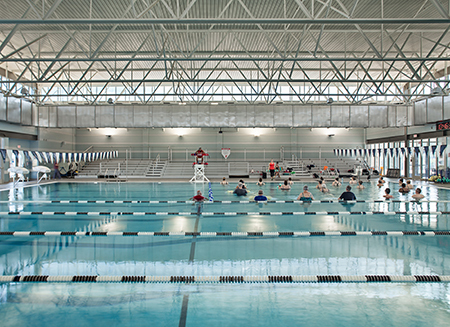 Members can participate in activities such as swimming and water aerobics. The natatorium also serves as a training and competition facility. 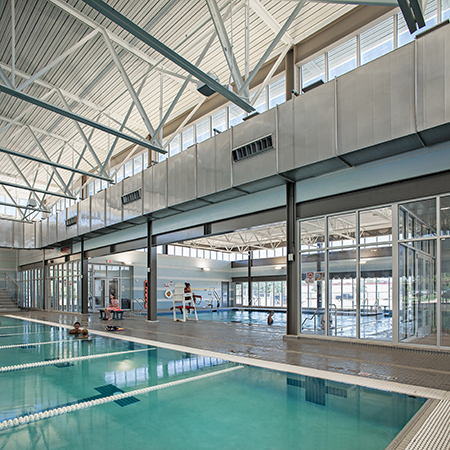 The aquatic center was approved by voters as part of a 2010 bond issue and was brought to life by a partnership between the City of Schertz, Schertz-Cibolo University Independent School District, and the YMCA. The natatorium consists of a 4,500 sq. ft., 25-yard competition pool with eight lap lanes, and a 1,200 sq. ft. instructional pool with stair entry and underwater bench seating. The outdoor area features a splashpad with interactive spray features. In November 2018, Counsilman-Hunsaker was contracted by the YMCA of Greater San Antonio to provide maintenance training for the staff at the Schertz Family YMCA. The training consisted of a National Swimming Pool Foundation® Certified Pool and Spa Operator (CPO®) Course for facility staff. The training also included site-specific maintenance training of the new facility’s equipment and operational needs, focusing on water quality, daily operations, and maintenance planning.